PRECIOUS NANO-SPRAY SERUM | Gescina The Chemistry of Nature Inc. 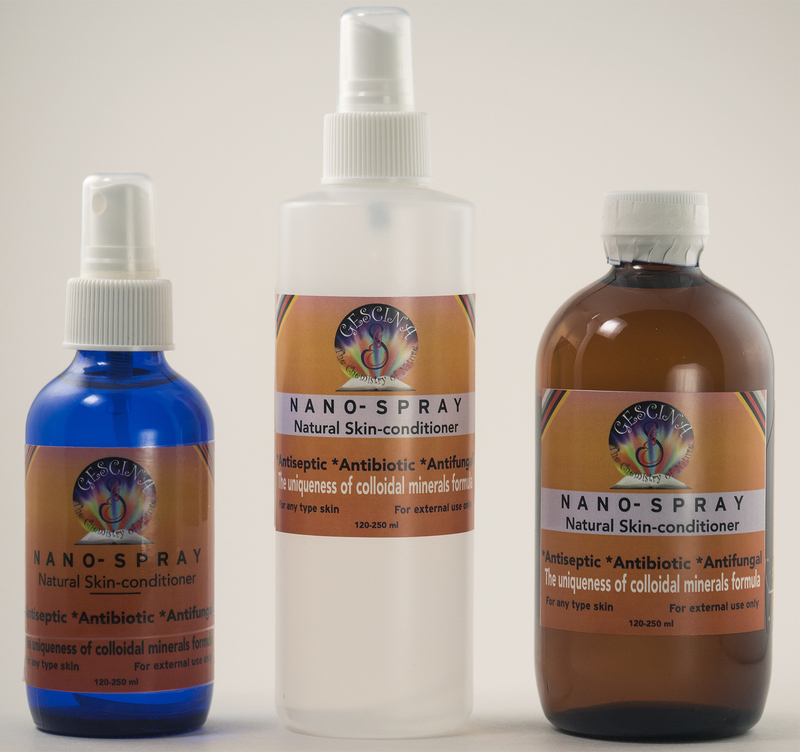 This is a unique Nano-spray Serum contains sufficient amounts of colloidal Gold, Silver, Copper, Zinc and, in some cases, other precious elements. All these ‘catalytically-active” elements carry tiny, pure and energy-active nano-particles, that easily travel through skin, and penetrate into individual cells, destroy single celled pathogens, that threaten one health, skin and well- being. Nano-particles of pure Gold, Silver, Platinum, Copper, Palladium, have high energy potential and capacity to fast absorb and delivery Vitamins, nutrients and Oxygen (in its active form) to deeper skin layers. This produces sound positive impact to skin health and appearance, but in long run- overall body well-being.Golden particles carry sun-type energy to each cell keeping it healthy and active. Precious NANO-Spray is safe for all types skin and ages. No concerns-just to maintain skin cells healthy and naturally- protected. This ultra-refreshing serum[spray] formulated as advanced concentrated rare precious and few health-support minerals source. No any smell at all! Use: Apply freely on cleaned skin 2-3 times make sure, your skin is wet sufficiently,Give it to dry naturally. *For persons with allergy to any metals: Even though, we do not have any negative feedback, please, check your personal reaction to NANO by applying small amount of our Precious NANO Serum in the wrist area. Cobalt or amber glass bottles with mist spay pumps, and 250 ml amber glass bottle for refiling.